Vietnam combines staggering natural beauty and a complex and diverse culture to create a destination that’s both exotic and compelling. A sensory overload, Vietnam is something of a history lesson – in one of the most beautiful classrooms in the world. Unforgettable experiences are everywhere in Vietnam, be it kayaking beside and inside karsts in Halong Bay, eating your way through the old town in Hanoi, exploring the magic of Van Long Nature Preserve or simply trying to cross the road with hundreds of motorbikes whizzing towards you. There’s the comedy of mopeds loaded with honking pigs weaving and wobbling down country lanes. There’s the seriousness of a lone grave in a cemetery of thousands of war victims. There’s the power and prosperity represented by tree-lined boulevards and French colonial state buildings. And of course there is the food; Vietnam is a culinary superpower formidable in its diversity and flavour. Yep, there’s plenty to see in Vietnam. If it’s your first adventure to Vietnam, it’s useful to know a few simple phrases before you go. One thing you should know is that it can sometimes take a few days to get into the Vietnam vibe. Hanoi, for example, is loud and chaotic and crossing the street can be a life or death situation. But Hanoi is also a city of intense charm and character, from narrow alleys and night markets to street vendors, peaceful parks and spectacular temples. Vietnam can challenge you, but go with open eyes and you’ll be awed by romance, the people, the food and everything in between. The currency in Vietnam is the Vietnamese dong (VND). International ATMs can be found in most tourist centres. You’ll be expected to use dong in rural areas, but you can get away with U.S. or Australian dollars in the larger centres. Small businesses generally don’t accept credit cards. Petty theft can be a problem in tourist areas, so hold on tightly to your valuables. Scamming can also be an issue – in fact it’s one of the most common complaints from travellers visiting Vietnam. Do your research, ask for personal recommendations, or book an organised tour to ensure you’re well taken care of. Police generally don’t speak English and are unlikely to offer much help when it comes to petty crimes. Vietnam has an affordable and comprehensive transport system but the going is slow. Don’t try to pack too much into your trip if you’re taking public transport or you’ll spend your entire time travelling. Again, an organised tour could be the safest and fastest way to travel. There are two seasons in Vietnam: the hot, dry season and the hot, wet season. It’s affected by three main weather patterns which can mean that weather is different wherever you go, but generally you should presume it’s going to be hot. Hué is one of Vietnam’s most engaging cities, boasting unparalled opportunities for historic and culinary exploration. Hué still exudes a regal and dignified air, having been the nation’s capital for 143 years. The 19th century walled citadel, on the north of the Perfume River, contains the once-magnificent Imperial City as well as an extensive grid of attractive residential streets and grand gardens. At the southern bounds, you’ll find pine-covered hills and palatial Royal Mausoleums built by Nguyen emperors. The Tomb of Khải Định, located in Chau Chu mountain, is a must-visit. Hanoi, with its picturesque pagodas, is Vietnam’s capital. Located on the banks of the Red River, it’s one of the most ancient capitals in the world. You’ll find well-preserved colonial buildings, unique museums, silks and handicrafts, a multi-cultural community and a vibrant nightlife. Not far away you’ll find tranquil countryside featuring lush parks, verdant mountains and traditional villages. Things to do in Hanoi include exploring the Old Quarter and taking a walk around Hoan Kiem Lake. Ngoc Son Temple, an 18th century Buddhist temple sits on a tiny island in the lake and is reachable via a bright red bridge (a great photo opportunity!). If you’re up for it, sit down with one of the many students that hang around this area hoping to practice their English with the tourists. If you were to see just one cave on your travels in Vietnam, make it either Phong Nha or Son Doong Cave, both otherworldly cavities only accessible by boat. Phong Nha is a whopping 8km long, although the public can only access the first kilometre. Until recently it was known as the largest cave in Vietnam, but nearby Son Doong Cave now takes the title of the largest cave in the world. The cave has only been open to the public since 2013, but the lucky few that have been through here say it’s life-changing. 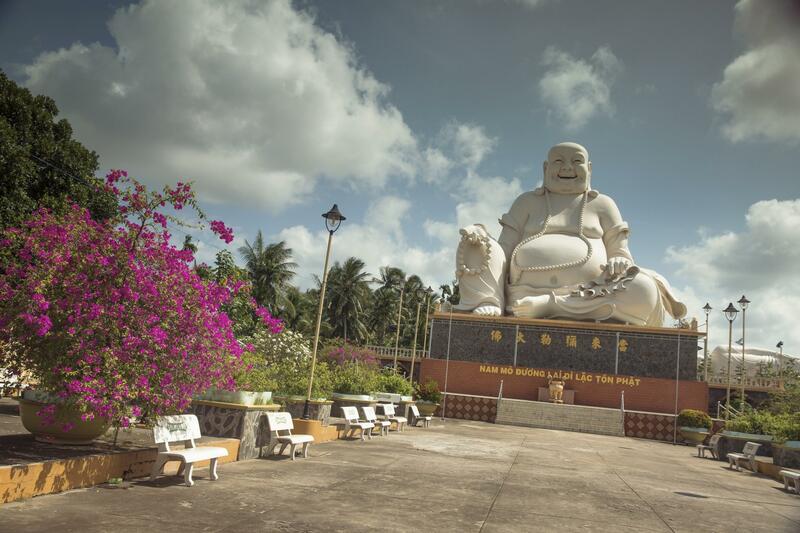 Jam-packed with sights, the small city of Hoi An is often a welcome surprise for visitors. Its laidback, almost dreamy atmosphere makes it an essential part of any busy tour. Narrow streets comprising wooden-fronted shophouses topped with moss-covered tiles maintain the city’s old-world charm. 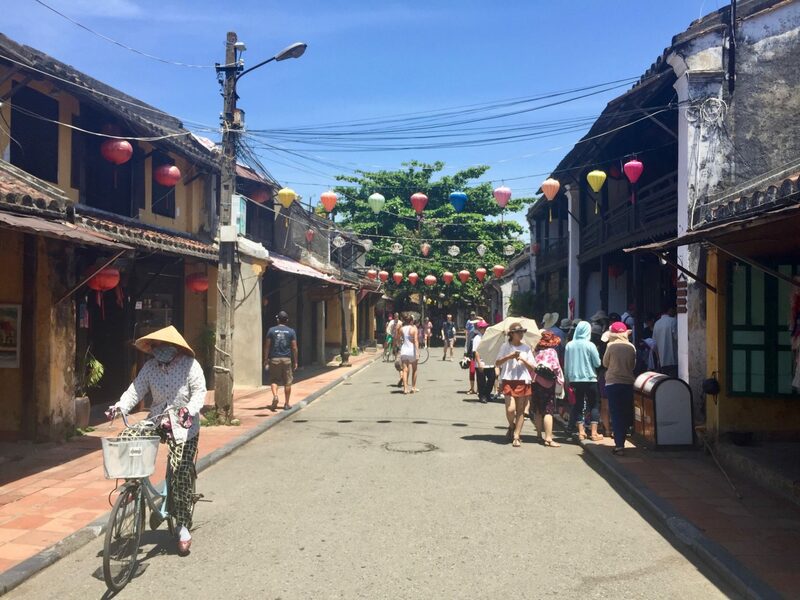 By law, businesses must dangle lanterns from their facades, and as you can imagine this creates a very pretty scene, complemented by the fact that Hoi An is the only place in Vietnam to place restrictions on motorbike use. If you are hoping to get anything tailor made in Vietnam, Hoi An is the place to do it. I’d recommend paying when you pick up your item though to avoid the aforementioned scammers. Vietnam’s centre of commerce and the country’s biggest city is perched on the banks of the Saigon River. Once known as Saigon, it’s changed its image from that of a war-torn city to one of a thriving metropolis. Even so, its eight million or so inhabitants still call the city Saigon. The action never stops in Ho Chi Minh City and as you dodge the motorbikes you can navigate through market alleys, inhale the incense that blows from temples and squat in the sidewalks to slurp down hot noodles. An interesting visit is the Museum of Ho Chi Minh City and for something to do at night, check out Turtle Lake, where all the young people hang out and mingle with friends while chowing down on snacks like banh trang tron and banh trang nuong. 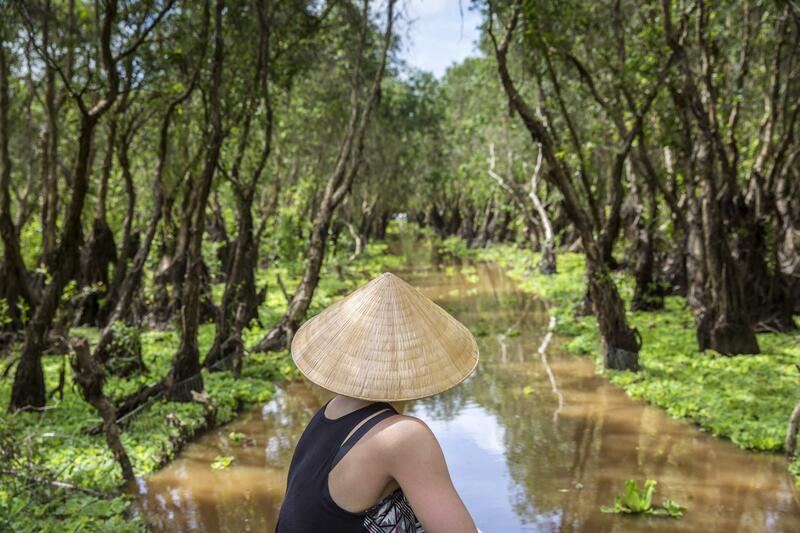 Touring the paddy fields, orchards and swamplands of the Mekong Delta is like stepping into the pages of National Geographic. Known as Vietnam’s rice bowl, it’s an agricultural miracle that pumps out more than a third of the country’s annual crop. As well as rice you’ll find coconut palms, sugar can groves and fruit orchards thriving in the nutrient-rich soil. Combine this with the conical-hatted farmers tending to the land and you have some of Vietnam’s most enduring imagery. To taste the best of the local produce, head to Sa Dec Market. Nha Trang has earnt itself the reputation of Vietnam’s top beach destination. Hawkers are on hand to supply fresh pineapples, paperbacks and massages, while scuba diving classes and watersports attract the adventurous. For those wanting to explore the nearby islands, local companies offer a plethora of day trips, many of which combine hiking, snorkelling and an onboard feast of seafood. Far more than sea and sand though, Nha Trang has a noteworthy culinary scene and some stylish boutiques and bars. For the history buffs, Po Nagar Cham Towers stand magnificently. Whether you’re traveling as a family, going solo, looking for bike and kayak adventures, or simply looking to explore some of the best food Asia has to offer, you can build a Vietnam trip tailored just for you. And the reality is that this country has so much to offer that you’re unlikely to see it all in one trip – so you can always go back to experience a different kind of Vietnam!